Better and superior version of the standard PANJAWAL (Gripper) version created to improve performance and serve the user flawlessly.. It is the better and superior version of the Standard “Panjawal (Gripper)" created to improve performance and serve the user flawlessly. 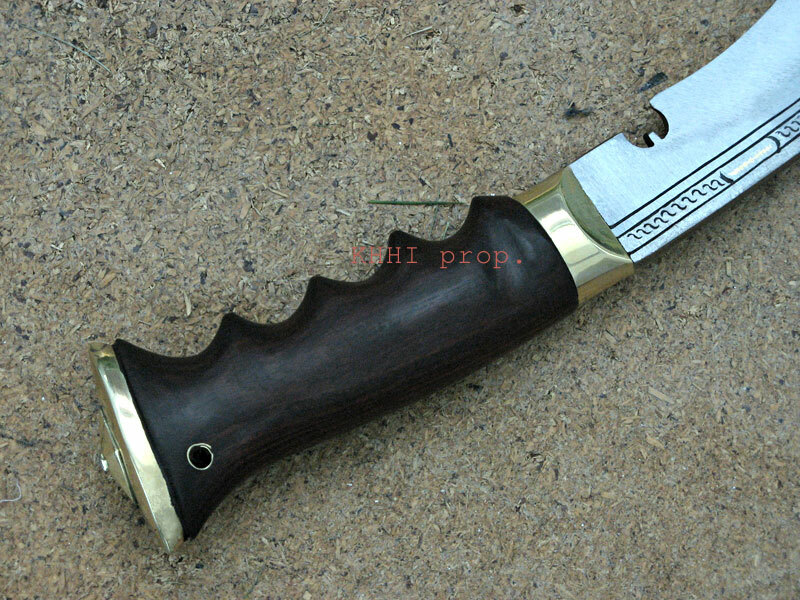 Crucial improvements are made on the khukuri like the wider bevel to strengthen the edge, thicker and broader blade for better and easier cut, compact wooden finger-grip handle with lanyard hole for superb handling, arrangement of a back up knife as a mini-immediate knife and a special brown leather scabbard designated for better look and durability truly makes this knife special and unique; an important hardware in woods and wild, one of the strongest contenders of KHHI’s amazing product lineup, worthy to pay and to play with; a true “Ranger” that would serve and safeguard it’s master in a typical Ranger fashion. Blade: Blade is semi-polished to give a smooth, silky and strong panel. The wider, broader and heavier blade also gives better feel, superior handling, controlled stroke and effortless cut. Bevel (edge) is extensively widened unlike any other khukuris to back up the sharp edge, enhance the cutting ability and enlarged the depth of the stroke against the target point/surface. The large steep bevel can penetrate into an object lethally inflecting deep-down impact. 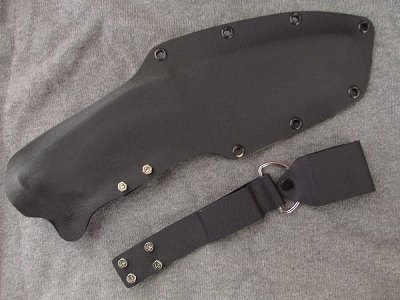 Back Up / Baby Knife: The usefulness and uniqueness of the kukri; featuring perfect handy size, excellent grip and superior scabbard is further boosted and taken to a next level up by the addition of an extra utility back up knife, to perform just about any cutting activities; small or big, minor or major. 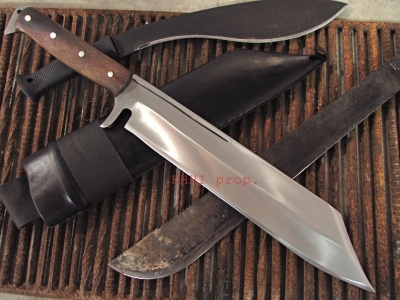 The small straight knife, crafted much stronger and better than the regular companion of a kukri (Karda) makes possible to cut even the smallest things and cuttings. 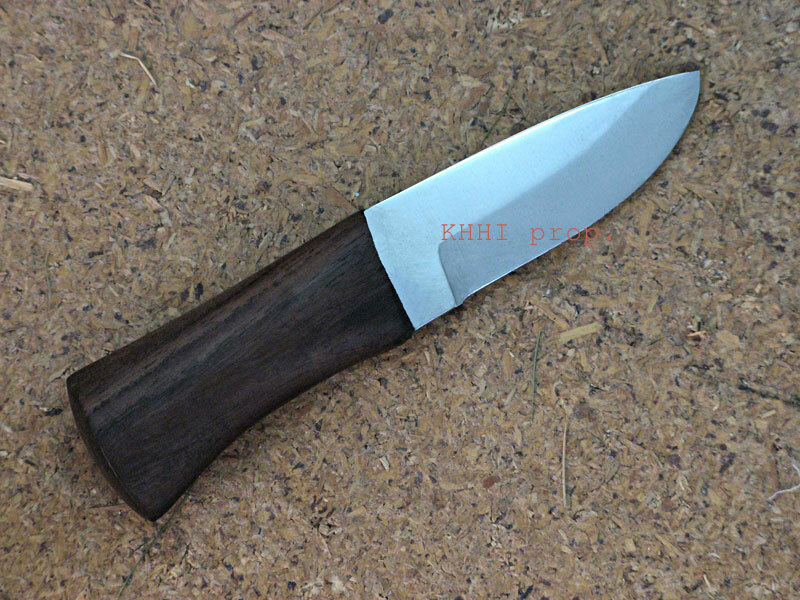 This back up knife will give the much needed support making the whole knife package more useful and worthy to have it at Home or in Jungle. Handle: An important and unique feature of the kukri designed to give perfect grip, ideal balance and better feel. The contours or curvatures at the front side of the handle will ensure that the fingers and the palm get a sturdy yet comfortable rest facilitating a better grip and easier hold. The lanyard hole is another important and interesting feature of the khukuri. 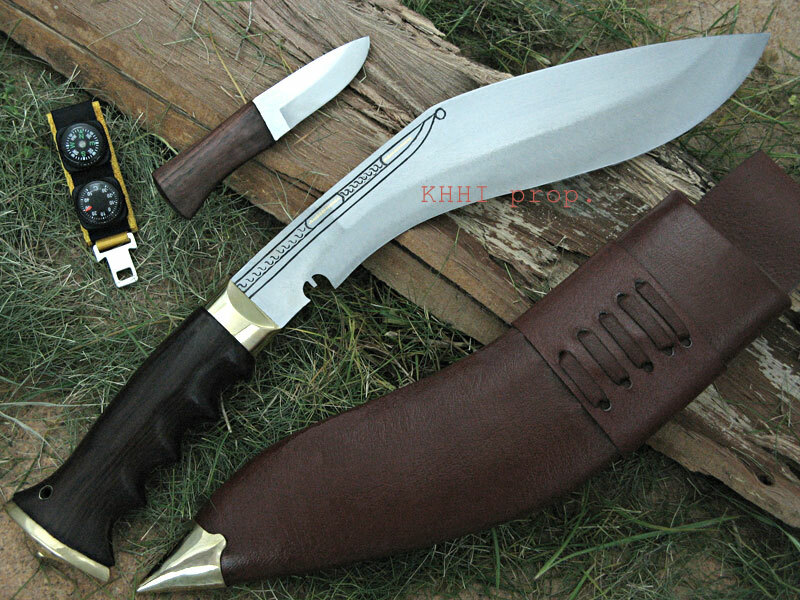 A leather string that goes through the hole and round the wrist of the using hand will ensure that the khukuri always stays in the hand close to the user even in slippery and wet conditions. 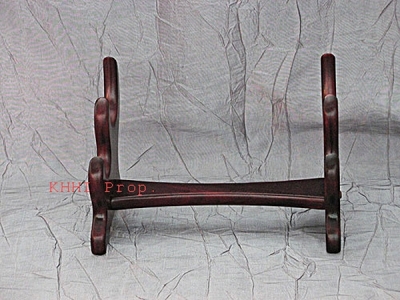 Scabbard: Special and durable leather is used of the scabbard. Style, comfort, durability and swift-handling are important element of this special scabbard. A brass “Kothi” (Chape) with a flattened tip is used as decoration and more importantly to prevent from piercing into things or flesh.